Leena is excited to start her senior year at boarding school—this year she'll be rooming at a small place, Frost House, with her best friends, instead of in some huge dorm. Her happiness is dampened slightly when Celeste Lazar is placed with them as well. Celeste is weird and caustic, and Leena is finding it difficult to get along with her, despite her developing friendship with Celeste's brother, David. But Leena bites her tongue and puts up with Celeste with a smile...until Celeste's behavior becomes seriously weird, and she starts claiming that there is something in Frost House that is messing with her. So then the question remains: is Celeste right about Frost House, or is she going crazy? Frost is a creepy and atmospheric that preys on the uncertainty of its characters, and the reader. This New England boarding school in the fall is the perfect setting for the book as Leena starts the school year off feeling totally at ease within Frost House and eager for the year to begin, but Celeste's discomfort and agitation is immediate. The strange happenings in their bedroom and closet seem only odd at first, and not threatening, but as the weeks go on, the tension in the house begins to tear apart at everything—the roommates' friendships, the tenuous peace between Leena and Celeste, Leena's growing relationship with David, and Leena's schoolwork and ambition. The added element of Celeste and David's mentally ill father keeps readers on edge, wondering if Celeste is or isn't crazy, until the matter is decided, leaving all the residents of Frost House in danger. Frost is fantastic debut, with wonderful character and plot development, dialogue, and some seriously suspenseful and intense scenes. This dangerous book is not to be missed. Cover Comments: I like the creepy looking house on the cover, and the colors used here--perfect. I thought that the way the girl is looking up, with her hands positioned the way they are, was a little odd, but it's grown on me. I like the cover. 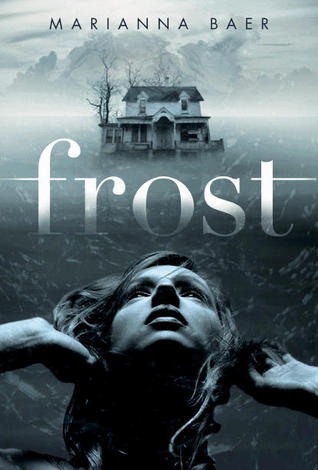 Frost will be available on September 13th, 2011. You can pre-order it here. Ooh, I do love a creepy book that builds tension as it goes. I haven't heard much buzz for this one but I'm totally adding it to my TBR list 'cause of your review. Yahoo! I loved Frost, and I love Marianna Baer. glad you did too! I adore a good thriller, and this one sound downright shudder-inducing. The cover, too, really draws me in. Thanks for sharing! Definitely a book I'll check out when it is released! This book sounds scary and exciting. Throw in some romance and I'm hooked!